Happy Memorial Day! Today i pretty much just exercised all day. Literally. I practiced for all my classes this week (turbo kick, tone n sculpt, step and weights) and then at 5:30om went to Sandy’s cycle class (I can only go on holidays when my step class is cancelled at the other gym), then zoomed on over to Zumba at the Z Club! Monica’s class was a BLAST! Hi energy, hi impact/fast, just how i like it to get a good sweat. I bought groceries at the store and asked Jeff to grill for dinner. 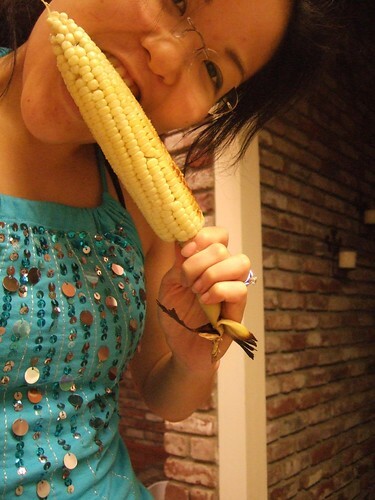 Came home to some yummy corn and tri-tip. Mmm mmm.